For use of ISSNs on Wikipedia, see Wikipedia:ISSN. Example of an ISSN encoded in an EAN-13 barcode, with explanation. NOTE: MOD10 in the image should be MOD11. The ISSN system was first drafted as an International Organization for Standardization (ISO) international standard in 1971 and published as ISO 3297 in 1975. ISO subcommittee TC 46/SC 9 is responsible for maintaining the standard. When a serial with the same content is published in more than one media type, a different ISSN is assigned to each media type. For example, many serials are published both in print and electronic media. The ISSN system refers to these types as print ISSN (p-ISSN) and electronic ISSN (e-ISSN), respectively. Conversely, as defined in ISO 3297:2007, every serial in the ISSN system is also assigned a linking ISSN (ISSN-L), typically the same as the ISSN assigned to the serial in its first published medium, which links together all ISSNs assigned to the serial in every medium. To confirm the check digit, calculate the sum of all eight digits of the ISSN multiplied by its position in the number, counting from the right (if the check digit is X, then add 10 to the sum). The modulus 11 of the sum must be 0. There is an online ISSN checker that can validate an ISSN, based on the above algorithm. ISSN codes are assigned by a network of ISSN National Centres, usually located at national libraries and coordinated by the ISSN International Centre based in Paris. The International Centre is an intergovernmental organization created in 1974 through an agreement between UNESCO and the French government. The International Centre maintains a database of all ISSNs assigned worldwide, the ISDS Register (International Serials Data System) otherwise known as the ISSN Register. At the end of 2016,[update] the ISSN Register contained records for 1,943,572 items. 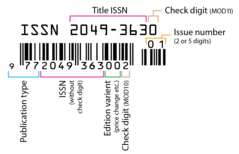 ISSN and ISBN codes are similar in concept, where ISBNs are assigned to individual books. An ISBN might be assigned for particular issues of a serial, in addition to the ISSN code for the serial as a whole. An ISSN, unlike the ISBN code, is an anonymous identifier associated with a serial title, containing no information as to the publisher or its location. For this reason a new ISSN is assigned to a serial each time it undergoes a major title change. Since the ISSN applies to an entire serial a new identifier, the Serial Item and Contribution Identifier (SICI), was built on top of it to allow references to specific volumes, articles, or other identifiable components (like the table of contents). Separate ISSNs are needed for serials in different media (except reproduction microforms). Thus, the print and electronic media versions of a serial need separate ISSNs. Also, a CD-ROM version and a web version of a serial require different ISSNs since two different media are involved. However, the same ISSN can be used for different file formats (e.g. PDF and HTML) of the same online serial. This "media-oriented identification" of serials made sense in the 1970s. In the 1990s and onward, with personal computers, better screens, and the Web, it makes sense to consider only content, independent of media. This "content-oriented identification" of serials was a repressed demand during a decade, but no ISSN update or initiative occurred. A natural extension for ISSN, the unique-identification of the articles in the serials, was the main demand application. An alternative serials' contents model arrived with the indecs Content Model and its application, the digital object identifier (DOI), as ISSN-independent initiative, consolidated in the 2000s. Only later, in 2007, ISSN-L was defined in the new ISSN standard (ISO 3297:2007) as an "ISSN designated by the ISSN Network to enable collocation or versions of a continuing resource linking among the different media". The print version of a serial typically will include the ISSN code as part of the publication information. Most serial websites contain ISSN code information. Derivative lists of publications will often contain ISSN codes; these can be found through on-line searches with the ISSN code itself or serial title. An ISSN can be encoded as a uniform resource name (URN) by prefixing it with "urn:ISSN:". For example, Rail could be referred to as "urn:ISSN:0953-4563". URN namespaces are case-sensitive, and the ISSN namespace is all caps. If the checksum digit is "X" then it is always encoded in uppercase in a URN. ISSN is not unique when the concept is "a journal is a set of contents, generally copyrighted content": the same journal (same contents and same copyrights) have two or more ISSN codes. A URN needs to point to "unique content" (a "unique journal" as a "set of contents" reference). Examples: Nature has an ISSN for print, 0028-0836, and another for the same content on the Web, 1476-4687; only the oldest (0028-0836) is used as a unique identifier. As the ISSN is not unique, the U.S. National Library of Medicine needed to create, prior to 2007, the NLM Unique ID (JID). ISSN does not offer resolution mechanisms like a digital object identifier (DOI) or an URN does, so the DOI is used as a URN for articles, with (for historical reasons) no need for an ISSN's existence. Example: the DOI name "10.1038/nature13777" can be represented as an HTTP string by https://dx.doi.org/10.1038/nature13777, and is redirected (resolved) to the current article's page; but there is no ISSN online service, like http://dx.issn.org/, to resolve the ISSN of the journal (in this sample 1476-4687), that is, a kind of https://dx.issn.org/1476-4687 redirecting to the journal's home. A unique URN for serials simplifies the search, recovery and delivery of data for various services including, in particular, search systems and knowledge databases. ISSN-L (see Linking ISSN below) was created to fill this gap. There are two most popular media types that adopted special labels (indicating below in italics), and one in fact ISSN-variant, with also an optional label. All are used in standard metadata context like JATS, and the labels also, frequently, as abbreviations. p-ISSN is a standard label for "Print ISSN", the ISSN for the print media (paper) version of a serial. Usually it is the "default media", so the "default ISSN". e-ISSN (or eISSN) is a standard label for "Electronic ISSN", the ISSN for the electronic media (online) version of a serial. ISSN-L is a unique identifier for all versions of the serial containing the same content across different media. As defined by ISO 3297:2007, the "linking ISSN (ISSN-L)" provides a mechanism for collocation or linking among the different media versions of the same continuing resource. The ISSN-L is one ISSN number among the existing ISSNs, so, does not change the use or assignment of "ordinary" ISSNs; it is based on the ISSN of the first published medium version of the publication. If the print and online versions of the publication are published at the same time, the ISSN of the print version is chosen as the basis of the ISSN-L.
With ISSN-L is possible to designate one single ISSN for all those media versions of the title. The use of ISSN-L facilitates search, retrieval and delivery across all media versions for services like OpenURL, library catalogues, search engines or knowledge bases. ^ a b "What is an ISSN?". Paris: ISSN International Centre. Retrieved 13 July 2014. ^ "Collection Metadata Standards". British Library. Retrieved 14 July 2014. ^ "ISSN, a Standardised Code". Paris: ISSN International Centre. Retrieved 13 July 2014. ^ "The ISSN for electronic media | ISSN". www.issn.org. Retrieved 28 September 2017. ^ Example of database implementation where seven-digit integers are used to store ISSNs. ^ <rozenfeld@issn.org>, Slawek Rozenfeld. "Using The ISSN (International Serial Standard Number) as URN (Uniform Resource Names) within an ISSN-URN Namespace". tools.ietf.org. ^ github.com/amsl-project/issn-resolver See p. ex. $pattern at source code (issn-resolver.php) of GitHub. ^ "Online ISSN Checker". Advanced Science Index. Retrieved 14 July 2014. ^ "Online ISSN Validator". Journal Seeker. Retrieved 9 August 2014. ^ "Total number of records in the ISSN Register" (PDF). ISSN International Centre. February 2017. Retrieved 23 February 2017. ^ "ISSN for Electronic Serials". U.S. ISSN Center, Library of Congress. 19 February 2010. Retrieved 12 July 2014. ^ a b "The ISSN-L for publications on multiple media". ISSN International Centre. Retrieved 12 July 2014. ^ Rozenfeld, Slawek (January 2001). "Using The ISSN (International Serial Standard Number) as URN (Uniform Resource Names) within an ISSN-URN Namespace". IETF Tools. RFC 3044. Retrieved 15 July 2014. ^ Powell, Andy; Johnston, Pete; Campbell, Lorna; Barker, Phil (21 June 2006). "Guidelines for using resource identifiers in Dublin Core metadata § 4.5 ISSN". Dublin Core Architecture Wiki. Archived from the original on 13 May 2012. ^ "MEDLINE®/PubMed® Data Element (Field) Descriptions". U.S. National Library of Medicine. 7 May 2014. Retrieved 19 July 2014. ^ "Road in a nutshell". Road.issn.org. Archived from the original on 5 September 2017. Retrieved 12 September 2017. "Cataloging Part", ISSN Manual (PDF), ISSN International Centre, archived from the original (PDF) on 7 August 2011 . How U.S. publishers can obtain an ISSN, United States: Library of Congress . ISSN in Canada, Library and Archives Canada . Getting an ISSN in the UK, British Library . This page was last edited on 11 March 2019, at 19:56 (UTC).